This decision is the first to invalidate certain sections of the Charter of the French Language. It is a landmark case pertaining to the language rights present in the Constitution Act, 1867. Blaikie, Durand, and Goldstein, three lawyers, suggest a clear incompatibility between sections 7 and 13 of the Charter of the French Language and section 133 of the British North America Act. The contradiction between these provisions is a result of the difference between the importance given to the English and French languages in the administrative provisions of the Charter of the French Language. According to sections 7 and 13, “only the French text of the statutes and regulations is official”, whereas according to section 133 of the British North America Act, both languages must carry equal weight. "Are sections 7 to 13 of the Charter of the French Language unconstitutional in light of section 133 of the British North America Act?" The Supreme Court dismissed the appeal and reiterates what the Court of Appeal and the Superior Court of Quebec stated. These two courts ruled in favour Blaikie, Durant, and Goldstein declaring the sections of the Charter of the French Language unconstitutional. Although both English and French may be used in Quebec and Federal parliamentary debates, all the documents originating from these parliaments must be published and printed in both languages. This decision therefore imposes an obligation of bilingualism on the Quebec government. This decision specifies the different types of delegated legislation subject to section 133 of the British North America Act. This case follows Attorney Gen. of Quebec v. Blaikie,  2 S.C.R. 1016. It revolves around the incompatibility between the provision of the Charter of the French Language and those of the British North America Act. A rehearing is requested, according to rule 61 of the Supreme Court Rules in order to determine the scope of section 133 of the British North America Act with regard to delegated legislation. The Supreme Court establishes that “[s]ection 133 of the British North America Act applies to regulations which constitute delegated legislation and to rules of practice enacted by the courts and quasi‑judicial tribunals. It does not apply to municipal or school bodies by-laws.” Semi-public agencies and civil administrations are subject to section 133 if they require the approval of the government. In this decision, the Supreme Court indicates that, from kindergarten to high school, educational instruction may be completed in either of the two official languages at the choice of the child’s parents. The Court also explores the conflict between sections 72 and 74 of the Charter of the French Language and section 23 of the Canadian Charter of Rights and Freedoms. Sections 72 and 73 of the Charter of the French Language establish French as the mandatory language of instruction from kindergarten to high school in the province of Quebec. However, it remains possible to obtain instruction in English if several conditions are met. According to section 23 of the Canadian Charter, Canadian citizens may send their children to public school in the official language of their choice, and this, even in provinces wherein either French or English is a minority language. "Are sections 72 and 73 of the Charter of the French Language compatible with section 23 of the Canadian Charter of Rights and Freedoms?" The Court of Appeal decision is upheld at the Supreme Court. The Supreme Court reiterates what was confirmed at the Quebec Court of Appeal (A.G. (Que.) v. Quebec Protestant School Boards,  C.A. 77) and at the Quebec Superior Court (Quebec Protestant School Boards,  C.A. 77 v. A.G. (Que. ),  C.S. 673). The judges conclude that the Quebec clause is incompatible with the Canada clause. The latter is national in scope and it is up to Quebec to meet the conditions laid down by section 23 of the Canadian Charter. The Supreme Court adds that the limitation of section 73 is not justified in view of section 1 of the Canadian Charter. The provisions of sections 72 and 73 of the Charter of the French Language have no force of effect in light of subsections 1 and 2a) of section 52 of the Constitution Act, 1982. This dispute focuses on the scope of section 133 of the Constitution Act, 1867 in order to rule whether judicial procedures of Quebec courts must be composed in the language of the recipient. This decision is part of the trilogy of language rights ruled by the Supreme Court in 1986, along with Bilodeau and Société des Acadiens. There is a certain level of institutional restraint from the court, who hesitates to apply a large and generous application of the linguistic rights guarantees. Mr. Macdonald argues that he has experienced a violation of section 133 of the Constitution Act, 1867, as the Municipal Court gave him a subpoena composed only in French while he is an Anglophone. "Is the subpoena, printed and published uniquely in French, that orders a person to present themselves in front of the Quebec Courts in conflict with the provisions of section 133 of the Constitution Act, 1867, therefore completely removing the Court's competency concerning this provision?" The constitutional right that is codified in section 133 of the Constitution Act, 1867 does not extend to procedural acts of Quebec courts. These courts can therefore distribute their procedural documents in the language of their choosing, regardless of the language of the recipient. In respect to the conclusions of Blaikie ( 2 R.C.S. 1016), the Supreme Court notes that section 133 of the Constitution Act, 1867, offers the possibility of every person to choose the language of their own process. However, this right does not extend to documents and procedural acts coming from the Quebec courts. Before the courts, guaranteed linguistic rights protect lawyers, witnesses, judges and other judicial officers who speak during the process. This protection does not apply to parties, or people towards which procedural acts are destined. This judgment discusses the constitutionality of the Regulation respecting the knowledge of the official language necessary to obtain a permit from a professional corporation (Regulation) adopted in conformity with the Charter of the French Language. Madam Forget contests the constitutionality of certain sections of the Regulation respecting the knowledge of the official language necessary to obtain a permit from a professional corporation (Regulation), which establishes a presumption concerning the appropriate knowledge of the French language in favour of candidates who have "taken at least three years of full time instruction given in French, at the secondary level or later." Forget, a nursing assistant, did not pass the written exam that she needed to submit in order to receive her certificate to practice by her professional order. The Regulation was adopted in conformity with section 35 of the Charter of the French Language, providing that a professional order cannot deliver a certificate to persons with a "[...] knowledge of the official language appropriate to the practice of [her] profession." Forget invokes that the listed provisions in question create a discrimination between Francophones and non-Francophones, and that it violates therefore their right to equality. "Do sections 2 a) and 3 of Regulation infringes upon their right to equality guaranteed by section 10 of the Quebec Charter of Human Rights and Freedoms (Quebec Charter)?" The contested provisions of the Regulation are compatible with section 10 of the Quebec Charter and do not violate Madam Forget's right to equality. The Court mentions that the provisions do not have "[...] the effect of nullifying or impairing the right to full and equal recognition and exercise of a human right or freedom." The Court recognizes that the provisions create a distinction in relation to a linguistic criterion. However, the Regulation does not prevent the non-Francophones from joining a professional order according to arbitrary motives, "[o]n the contrary, the Regulations enacted by the Office de la langue française allow them to show that they possess the necessary skills to be admitted to a professional corporation." The decision shares many similarities with the decision made in Ford, rendered some months later. These two decisions invalidate certain provisions of the Charter of the French Language that were judged to be unconstitutional. In 1982, the Government of Quebec had adopted the Act respecting the Constitution Act, 1982. This law had as an objective that provincial laws could derogate from the application of sections 2 and 7 to 15 of the Canadian Charter. Hence, the Canadian Charter does not apply to sections 52 and 58 of the Charter of the French Language. It should be noted that such a derogation to the Canadian Charter must be renewed every five years. Mr. Devine, a Montreal businessman, contests the validity of sections 52, 57, 58, 59, 60 and 61 of the Charter of the French Language and the Regulation respecting the language of commerce and business. Section 58 provides that public signage and public business must be conducted only in French. The provisions according to the appellant are contrary to the Canadian Charter in addition to the Quebec Charter. Whether the above provisions infringe the right to equality guaranteed by s. 15 of the Canadian Charter of Rights and Freedoms and the guarantee against discrimination based on language in s. 10 of the Quebec Charter of Human Rights and Freedoms." As per the question of the division of powers, the Court confirms that the language is an accessory competency to the exclusive power of provincial governments and the Federal Government. Provinces have the right to produce linguistic regulations and to attach penal sanctions to these provisions, as such is the case with section 58. Concerning the unconstitutionality of the provisions, according to the Court sections 57, 59, 60 and 61 violate the freedom of expression guaranteed by section 2 b) of the Canadian Charter and section 3 of the Quebec Charter. These provisions impose the exclusive use of French and they cannot be justified by section 1 of the Canadian Charter nor by section 9.1 of the Quebec Charter. Sections 59, 60 and 61 of the Charter of the French Language are therefore unconstitutional. However, sections 52 and 57 remain in effect subsequently to the test of section 9.1 of the Quebec Charter, and for section 57 as well in virtue of section 1 of the Canadian Charter, because these provisions authorize the use of the French language conjointly with that of another language. An important Supreme Court decision concerning the unconstitutionality of certain provisions of the Charter of the French Language. In addition to having being rendered the same year, this decision shares many similarities with the judgment made in Devine. This judgment remains pertinent as the Court distances themselves from their strict interpretation of the 1986 trilogy to language rights. This judgment obligated the Quebec government under Robert Bourassa to adopt the Act to amend the Charter of the French language (Bill 178) which provides that section 58 of the Charter of the French Language derogates from the application of sections 2 b) and 15 of the Canadian Charter and from sections 3 and 10 from the Quebec Charter. These sections guarantee the rights to freedom of expression and equality. In 1982, the Government of Quebec adopted the Act respecting the Constitution Act, 1982. This bill had as an objective to evade Québec's provincial laws as a whole from the application of sections 2 and 7 to 15 of the Canadian Charter. Consequently, the Canadian Charter does not apply to sections 52 and 58 of the Charter of the French Language. It should be noted that this type of particular derogation must be renewed every five years. Ford seeks to invalidate sections 58 and 69 of the Charter of the French Language (CFL), because these provisions infringe on the freedom of expression guaranteed by section 3 of the Quebec Charter and are not justified within the framework of section 9.1 of the same charter. Section 58 of Bill 101 requires that "public signs and posters and commercial advertising must be in French," and section 69 stipulates that "[. . .] only the French version of a firm name may be used in Québec." "Does ss. 58 and 69 infringe the freedom of expression guaranteed by s. 2(b) of the Canadian Char­ter and s. 3 of the Quebec Charter of Human Rights and Freedoms?" It was determined by the Supreme Court that sections 58 and 69 infringe the freedom of expression guaranteed by section 3 of the Quebec Charter, considering that this right includes the freedom to express oneself in the language of their choosing. Although these provisions respond to a very real and urgent need and seek an important objective, the means employed to attain this legislative are not proportional to the objective, and thus are not justified in virtue of ss. 9.1 of the Quebec Charter. To require that the French language remains predominant on all public signage would respect the principle of proportionality and would be justified in respect to section 9.1 of the Quebec Charter. Section 58 also contravenes with section 10 of the Quebec Charter that guarantees the right to equality. Indeed, the exclusive use of French created a distinction founded on the language. Section 58 is therefore invalid. For technical reasons, section 69 of the Charter of the French Language is subject to the application of the Canadian Charter. The provision is invalid with respect to section 2 b) of the Canadian Charter, as it infringes on the freedom of expression. Such a violation cannot be justified in virtue of section 1 of the Canadian Charter. Ballantyne, Davidson, McIntyre v. Canada, Marc 31, 1993, Communications n° 359/1989 and 385/1989, Doc. N.U. CCPR/C/47/D/359/1989 and 385/1989/Rev.1. A decision from the United Nations Human Rights Committee on the legality of the Act to amend the Charter of the French language (Bill 178), adopted by the Quebec government of Robert Bourassa in the wake of the Ford ruling in 1988 which invalidated certain provisions of the Charter of the French Language. Bill 178 derogates from the application of the Canadian and Quebec charters. To be valid, the derogation from the application of both the Canadian and Quebec charters must be renewed every five years. Bill 178 has not been in effect since 1993, and the Bourassa government did not renew it. Anglophone Quebec merchants consider themselves wronged by the government's use of the derogation in order to obligate merchants to only use French on public signage in Québec. They argue that Bill 178 infringes their right to freedom of expression and their minority rights, in addition to creating discrimination in respect to sections 2 and 19, 27 and 26 of the International Covenant on Civil and Political Rights (Covenant) respectively. "Does Bill 178 violate provisions 2 and 19, 27 and 26 of the International Covenant on Civil and Political Rights?" The Human Rights Committee comes to substantially the same conclusion as that of the Supreme Court in Ford. The obligation to have all public signage uniquely in French violates the freedom of expression of merchants. This right extends also to commercial activities and is not limited only to types of political, cultural or artistic expression, as argued by the government of Quebec. The Court cannot arrive at a conclusion about whether there is discrimination or not between Anglophones and Francophones in Québec. Indeed, the Francophones in Québec wanting to use English on their public signage in order to attract an Anglophone clientele also encounter the same prohibition as the Anglophone merchants. The Committee rejects the argument based on the minority rights as per section 26 of the Covenant. In fact, Anglophone citizens in Canada cannot be considered as part of the country's minority. Section 530.1 e) of the Criminal Code forces the prosecutors to speak the official language spoken by the accused. Substitutes for the Attorney General of Quebec are attempting to invalidate this provision, which does not allow them to use French and would in consequence contravene their rights guaranteed by section 133 of the Constitution Act, 1867. Several Anglophones accused of criminal offenses are demanding to have their trials before an Anglophone judge and jury. The substitutes for the Attorney General, being Francophone, mention to the trial judge that they are planning to use French if there is a trial without jury. The judge reminds them that section 530.1 e) of the Criminal Code does not allow them to proceed as such. The prosecutors are contesting the constitutionality of this provision which, according to them, is contrary to section 133 of the Constitution Act, 1867 which guarantees, among other things, that lawyers have the right to use either English or French before the courts. "Does section 530.1 of the Criminal Code violate section 133 of the Constitution Act, 1867 by forcing prosecutors to speak the same language as the accused?" Section 530.1 e) of the Criminal Code remains valid and in effect in the province of Quebec. As it is stated in the provision, in a criminal case, the accused has the right to a prosecutor (including a substitute for the Attorney General) who speaks the same official language as he or she does. Once the trial begins, the judge may not prohibit a substitute from speaking French when the official language of the accused is English because this would contravene section 133 of the Constitution Act, 1867 and consequently, the rights of the substitute. Thus, the Attorney General has to choose its substitutes based on the official language of the accused, and this before the commencement of the trial. To adopt the position of the prosecutors and render the provision unconstitutional would create an absurd result because, with such a judgement, Francophones who are accused of criminal infractions could be deprived of their right to an Anglophone prosecutor without being able to do anything about this reality. Section 530.1 e) seeks rather to prevent such a situation and to protect minority language rights. A motion to invalidate section 530.1 e) of the Criminal Code which forces prosecutors to use the official language of the accused during criminal proceedings. This provision would be contrary to the language rights guaranteed by section 133 of the Constitution Act, 1867. The facts are the same as those in Cross c. Teasdale, (1998) R.J.Q. 2587 (C.A.). Anglophones accused of criminal offenses in Quebec are demanding that the prosecutors in their trials use the same language as they do during the instruction for judgement stage. The prosecutors add that they want to use French during the trial itself. To support their position, the prosecutors allege the unconstitutionality of section 530.1 e) of the Criminal Code which forces them to use the same official language as the accused during a criminal trial. The prosecutors claim that this provision violates their rights guaranteed by section 133 of the Constitution Act, 1867. Section 530.1 e) remains valid and it respects the constitutional guarantees of section 133 of the Constitution Act, 1867. The judges of the Court of Appeal confirm the decision in Cross and refer to that decision in order to decide upon the constitutional validity of section 530.1 e). See Cross c. Teasdale, (1998) R.J.Q. 2587 (C.A.) for the complete judgement of the Court of Appeal on this subject. This reference did not address language rights directly as its principal purpose was to establish the elements applicable to the secession of a province from the Canadian confederation. However, the Court used this reference as an opportunity to recognize that the protection of minorities is an underlying principle of the Canadian constitution. This demonstrates an interest in the protection of language rights. "Three questions were submitted to the Court by the Federal government regarding the constitutionality of an eventual secession of the province of Quebec, only one of which is reproduced here." "1. Under the Constitution of Canada, can the National Assembly, legislature or government of Quebec effect the secession of Quebec from Canada unilaterally ?" The first question received a negative answer. The Court indicated that the Constitution contains not only written rules, but also unwritten ones. Four unwritten constitutional principles were utilized to answer the questions submitted by the government. One of these principles is the protection of minorities. This principle was one of the factors responsible for the adoption of the Canadian Charter and it is reflected in the provisions regarding linguistic minorities in the Canadian (written) constitution. Moreover, this principle predates the Charter and was an important component of the Canadian constitution from the time of Confederation. This judgement falls within the context of municipal mergers and raises questions regarding the protection of linguistic minority groups via the provisions regarding the right to equality guaranteed by section 15 of the Canadian Charter. Prior to the municipal mergers, the Charter of the French language was applicable to the entire Montreal Urban Community. However, the city of Westmount possessed a certificate granted via section 29.1 of the Charter of the French language, which allowed it to use English in its administration. With the passing of Bill 170, Westmount became a borough of the city of Montreal. The bill in question established that Montreal is a French city, but maintained the Anglophone or Francophone status of Montreal boroughs if these boroughs possessed an exemption certificate in accordance with section 29.1 of the Charter of the French language. However, this bill did not grant bilingual status to boroughs who prior to the merger who did not possess this exemption certificate. Bill 170 is being contested in this suit by citizens claiming that it produces different effects for Anglophone citizens dependent upon whether they live in borough possessing or not bilingual status based upon this law. Consequently, they claim that Bill 170 violate their equality right guaranteed under section 15 of the Canadian Charter. "Does Bill 170 violate the right to equality guaranteed by section 15 of the Canadian Charter ?" The Anglophone’s citizens’ right to equality, guaranteed by section 15 of the Canadian Charter, was not violated. The Supreme Court concludes that the appellants (City of Westmount and some of its citizens) were unable to prove that there is a different treatment based on language or association to a particular linguistic group. However, the Court concludes that there is a disparity of treatment based on the place of residence rather than the language spoken. This decision of the Quebec Court of Appeal is on the subject of the protection of minorities, an underlying principle of section 16(3) of the Canadian Charter. In this case, the highest court in Quebec must respond to a permanent injunction suit targeting the unconstitutionality of the Act to reform the municipal territorial organization of the metropolitan regions of Montréal, Québec and the Outaouais which is responsible for the elimination of individual municipalities by merging them all together into the cities of Montreal and Quebec City, as well as sections 6, 11, and 12 of the Act to amend the Charter of the French Language. These laws are responsible for changing the conditions for a municipality to be considered bilingual. Historically, this status could be obtained if the majority of the residents of the municipality spoke a language other than French. The amendment changed that requirement to the condition of the majority of the residents of the municipality being Anglophones. "Do the new conditions established by the Act to reform the municipal territorial organization of the metropolitan regions of Montréal, Québec and the Outaouais and the Act to amend the Charter of the French Language violate the principle of the protection of minorities; an underlying principle of section 16(3) of the Canadian Charter?" The Court of Appeal puts the principle of the protection of minorities of section 16(3) in context. Although the Court admits that there is a reduction of services being offered to the Anglophone community since the amendments, it refuses nonetheless to apply section 16(3), even from a more general interpretation of the principle. According to the Court, too generous of an application of the principle would effectively eliminate the Quebec government’s exclusive authority regarding municipal affaires. This judgement defines the constitutionality of section 7 of the Charter of the French language, and more specifically the criteria of the “major part” of a child’s education, which is necessary in order to obtain a certificate of admissibility to attend English public school in Quebec. This decision falls within the political and legal debate surrounding English-language transition schools. The children of three families were refused admissibility certificates for English public school. Although the circumstances are different in each case, in all three of them, the certificates were refused under the pretext that the children had not completed the “major part” of their education in English as per section 73(2) of the Charter of the French language. The parents of these children are claiming that the provision in question contravenes section 23(2) of the Canadian Charter of Rights and Freedoms. "Is the criteria of the “major part” contained in section 73(2) of the Charter of the French language contrary to section 23(2) of the Canadian Charter of Rights and Freedoms ?" The appeal is partially allowed – the appellants’ children are admissible to English public school. However, although there is a conflict between section 23(2) of the Charter of Rights and Freedoms and section 73(2) of the Charter of the French language, the Quebec law does not contravene the Canadian Charter, if it is interpreted correctly. In order to do such an analysis, it is necessary to conduct a qualitative evaluation adapted to the reality of each child. This analysis determines whether a child has received an important part of his education in English, which denotes a real commitment to pursue studies in the minority language (English). The Gosselin decision arises from dissatisfied parents of the francophone majority in Québec who cannot register their children in an Anglophone educational institution in the province, in accordance with the Charter of the French Language. Francophone parents born in Quebec attempt to register their children in an Anglophone educational institution. To do so, they contest the constitutional validity of section 73 of the Charter of the French Language. They argue that the provision is in violation of their equality rights guaranteed by section 10 of the Quebec Charter. Section 73 authorizes access to instruction in English only for children who already received English instruction elsewhere in Canada, or to those whose parents did their primary studies in English in Canada. "Does section 73 of the Charter of the French Language infringe on the equality rights guaranteed by section 10 of the Quebec Charter as well as section 15 of the Canadian Charter?" The Court rejected the appellant’s argument and maintained the validity of section 73 of the Charter of the French Language. Section 73 of this charter does not create a distinction between the admissions of certain children for instruction, but obliges the government to offer quality instruction for the linguistic minority of the province. The desire for the appellants to have their children from the francophone majority in Québec instructed in an English educational institution conflicts with the objective of section 23 of the Canadian Charter that protects the linguistic minorities of each province. The argument of the appellant’s conflicts with the objective of section 23 of the Canadian Charter. In this case, this provision inserts into the desire to promote the development of the Anglophone minority in Québec and the francophone minority in the other Canadian provinces. The appellants claim had the effect of making non-operational the constitutional rights set out in section 23 of the Canadian Charter. The Court highlights that "there is no hierarchy amongst constitutional provisions. Equality guarantees cannot therefore be used to invalidate other rights expressly conferred by the Constitution." A decision concerning the competence of the Administrative Court in the matter of linguistic rights. The appellants present themselves in front of the Superior Court of Quebec to authorize their children to attend a subsidized English educational institution in virtue of section 73 of the Charter of the French Language. By proceeding this way, the appellants short-circuited the judiciary process as such a demand normally must be presented before the Administrative Tribunal of Quebec. 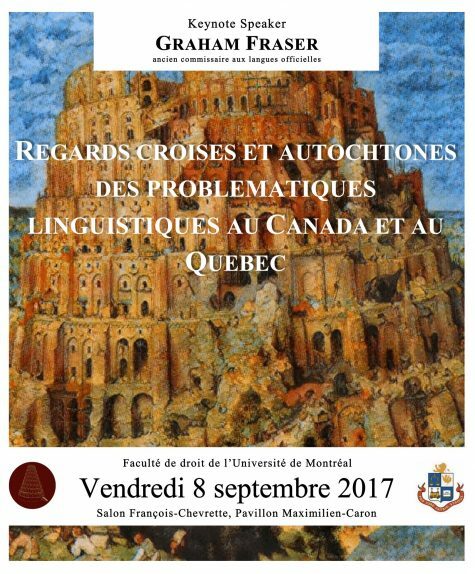 "Whether the Administrative Tribunal of Quebec has exclusive jurisdiction to hear appeals in respect of entitlement to minority language education? Whether the Administrative Tribunal of Quebec can decide constitutional questions incidental to its determination of entitlement to minority language education?" The Supreme Court has established that the Administrative Tribunal of Quebec has the exclusive power to hear appeals in respect of the entitlement to minority language education. Section 83.4 of the Charter of the French Language confers to the Tribunal this exclusive power for all disputes regarding section 73 of the Charter of the French Language. This Court also maintains the capacity to decide constitutional questions, including those which regard section 73 of the Charter of the French Lanaguage and section 23 of the Canadian Charter. In 2002, the National Assembly of Quebec adopted Bill 104, also known as the Act to Amend the Charter of the French Language, 2002. The amended provisions in the matter of education were judged necessary considering the emerging phenomenon of schools considered "bridging schools," which were schools that allowed the evasion of the pith of section 73 of the Charter of the French Language. The Supreme Court followed the recommendations laid out in Solski to render their decision concerning Nguyen. The respondents are Canadian citizens who have never received primary education in English in Canada. Bypassing the criteria established at section 23 (1)b) of the Canadian Charter, they register their children in unsubsidized private schools (UPSs) that offer instruction in English. Following this, they demanded authorization from the Minister to declare their children admissible to subsidized education in English. The appellant's wish to invalidate section 73 of the Charter of the French Language, as paragraphs 2) and 3) of section 73 prohibit to recognize the instruction made in these UPSs. "Whether paras. 2 and 3 of s. 73 of Charter of the French language limit rights guaranteed by s. 23 of Canadian Charter of Rights and Freedoms?" As paragraphs 2 and 3 of section 73 of the Charter of the French Language infringe on the rights guaranteed by paragraph 23 (2) of the Canadian Charter, they are declared invalid by the Supreme Court. Even though the Court acknowledges the objective of this provision as sufficiently important and legitimate to justify this limitation, the means chosen are not proportional to the objectives. The Court also recognizes the fact that this provision represents only a minimal impairment on constitutional rights, and the Legislature of Quebec can meet their legislative objective in other ways than introducing a total prohibition of attending UPSs. The judges highlight the excessive character of paras. 2 and 3 of section 73, which refuses to recognize the schooling of a child in an UPS. The Court demands an analysis of the situation for each institution of the clients to determine if the educational track can be certified and be considered admissible to a subsidized Anglophone school. The Court seeks to nuance their conclusion by adding that "a short period of attendance at a minority language school is not indicative of a genuine commitment and cannot on its own be enough for a child’s parent to obtain the status of a rights holder under the Canadian Charter." This content has been updated on 10 April 2017 at 9 h 51 min.